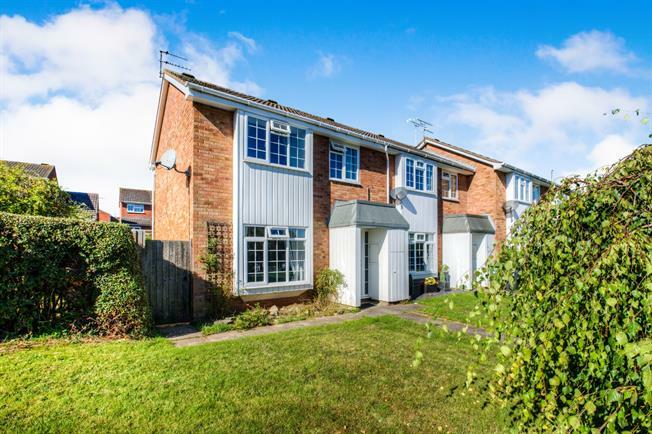 2 Bedroom End of Terrace House For Sale in Leamington Spa for Asking Price £220,000. Situated on an end plot is this well presented, two double bedroom end of terrace property, benefiting from having a larger than average garden with scope to extend, subject to planning permission, located in the village of Bishops Tachbrook. The property comprises an entrance hallway, L shaped living dining room and kitchen. Upstairs are two double bedrooms with build in wardrobes and four piece bathroom suite. Outside offers a generous sized rear garden and single garage en bloc. With access to the living room and kitchen. Having stair rising to the first floor and radiator. L shaped living dining room with feature fireplace with gas fire and radiator. Dual aspect with windows to both front and rear. Fitted with a range of eye and base level units, offering worktop space, incorporating a stainless steel sink with mixer tap and drainer. Integrated four ring gas hob with overhead extractor and oven. Space and plumbing for washing machine and fridge freezer. Tiled flooring, part tiled walls, window and door leading to the rear garden. With two windows to front, radiator and built in wardrobes. Window to rear, radiator and a range of built in wardrobes. Fitted with a four piece white bathroom suite, comprising a panelled bath, separate shower cubicle, low level wc and pedestal wash hand basin. Heated towel rail, tiled walls, spotlights and window to rear. Garden to front, mainly laid to lawn with Willow tree and pathway leading to the front door. Generous side rear and side garden, mainly laid to lawn with patio area.